Lighting equation coefficients that are dependent on a specific source of light can be optionally multiplied by an attenuation factor. This attenuation factor allows to simulate the light fading with distance. There are several ways to calculate the attenuation factor. We're going to see two of them. The attenuation factor is computed in the vertex shader and then is passed to the pixel shader through the varying float att; variable. Fig.5 - The point_light_att.xml demo. A value of invRadius=0.001 (i.e 1000.0 units radius) will allow you to start your tests. The final word: all vertex / pixel shaders previously seen are for all-purposes (i.e they are not bound to Demoniak3D), do not take input parameters (i.e no uniform variables) and so they can be effortless used in any OpenGL application. That said, have a good coding! Computer Graphics Using OpenGL: Chap: Introduction to Shading Models, p417 - ISBN: 0-02-354856-8. 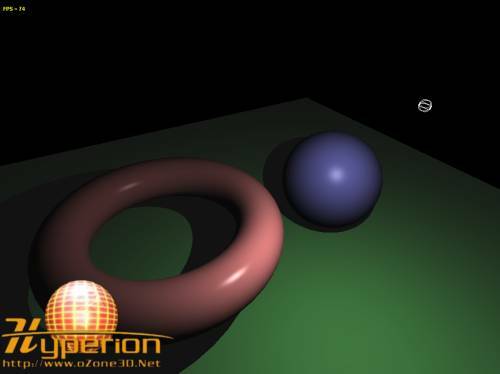 Implementing Lighting Models With HLSL: Theory and practice with Direct3D. The RenderMan Academy: Phong Shading Model: Theory and practice with RenderMan. 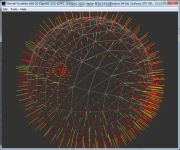 All projects have been successfully tested on a nVidia Geforce 7800GT (with Forceware 81.98) and on an ATI Radeon X700 Pro (with Catalyst 6.1). Page generated in 0.0018339157104492 seconds.